Home » blog » Your New Year New Gluten Free Lifestyle! Your New Year New Gluten Free Lifestyle! If you are not feeling as happy, healthy and as energetic as you would like — even on a gluten free diet — embrace this as your new year new gluten free lifestyle! No matter how long you’ve been living gluten free, you can probably do better. Everyone gets in a rut sometimes; the new year is the perfect time to assess where you are in your gluten free lifestyle and how you can do better. And by doing better, I mean eating for better nutrition AND enjoying a happier gluten free life without deprivation: your new year new gluten free lifestyle! Here are 21 easy ways you can change your habits to live healthier, feed your family better, add new foods into your diet, give to others and become more disciplined about the way you treat your body. All this without feeling depressed or deprived about what you can’t do or eat. In my yoga classes, they speak of having “sankalpa”, or a will, purpose or determination. It’s not about creating a resolution NOT to do something; instead think of the New Year as an opportunity to set an intention to be more aware of gluten contamination, to make more food at home (it’s cheaper, safer and tastes better), and to not deprive yourself of something, but instead find a way to make it gluten free so you can still enjoy it. ♦Play with your food. Making food is being creative; treat the plate as your canvas, the ingredients as your paints. You and your family will have so much fun making cookies, stuffing ravioli, topping homemade pizzas, drawing with pancake batter … and will enjoy the results far more than simply reheating a frozen dinner or eating a lackluster (and potentially risky) meal out. ♦Try a new fruit – starfruit, kiwi, mango, plantain, clementines … surprise your kids by packing a fun new fruit in their lunches! ♦Add fiber to your diet – whole gluten-free grains like certified gluten free, purity protocol oatmeal and flaxseed meal can be added to existing recipes, sprinkled on cereal or yogurt, or can be the foundation of a meal. Learn more about choosing the safest oatmeal options for your family in this article. Gluten free oats make a fiber-rich, nutrient-packed, delicious breakfast. ♦Add smoothies into your morning routine. We use tons of fruit, walnuts and certified gluten free purity protocol gluten free oats, plus several handfuls of spinach, and it makes a filling, nutritious and super tasty breakfast, mid-morning snack or late afternoon/after school treat. ♦Keep grab & go protein shakes in the fridge for those times when you don’t have time for breakfast, need a pick-me-up or a post work-out recharge. 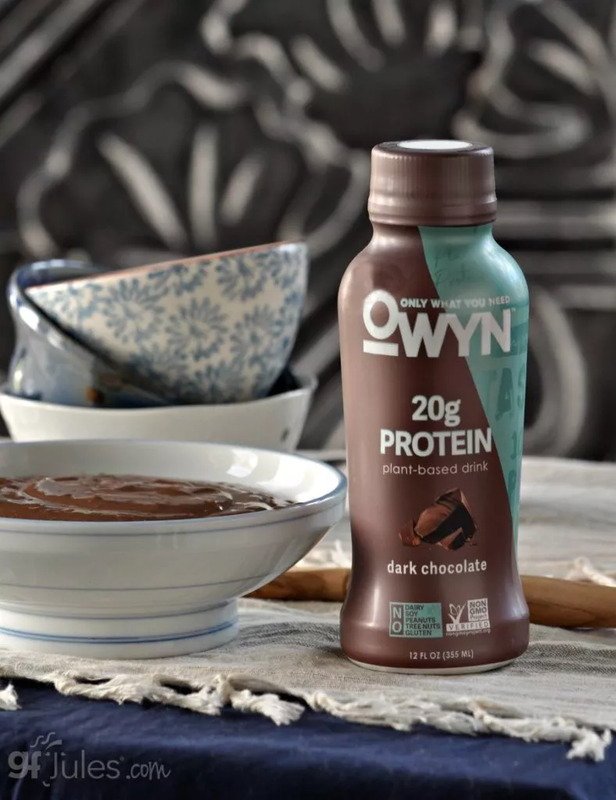 My favorite new protein shake is OWYN (Only What You Need). * It’s gluten-free, vegan and free of the top 8 food allergens, but tastes so good even my kids will drink it (bonus!). It’s lower in sugar than many protein drinks, plus it offers fiber and Omega 3s with no chemicals or GMOs. The cold brew coffee flavor is incredibly smooth and can often be found in my hand as I drive carpool. ♦Pack a healthy snack instead of candy for a treat – easy to eat fresh fruit like clementines, grapes or bananas, a handful of nuts, trail mix, popcorn or yogurt can be just as sweet, but also offer loads of health benefits. ♦Go meatless – on Fridays or Mondays or whenever you like. Explore other protein sources like tofu, quinoa, nuts and fish. Recipes like homemade gluten free ravioli, gluten free Pad Thai and Veggie Burritos with homemade gluten free tortillas are a favorite any night you choose, make great leftovers and helps you clean out your fridge! Check out some of my recipes to get you started, like my new recipe for Vegetarian Meatloaf, Vegetarian Lasagna with homemade gluten free noodles! and Veggie Meatballs made with Hilary’s Eat Well Veggie Burgers*. ♦Start a new weekly dinner tradition. Even if your family is too busy to sit down for a meal together every night, choose just one night each week where everyone can count on sitting down to the same meal and enjoying the food and fellowship of eating together. Search through all the mains and side dish recipes on my site using the search bar here. One of our favorites is Homemade Gluten Free Pizza Night! Gluten free baguettes made with gfJules Pizza Crust Mix and brushed with whole egg wash for darker browning of the crust. ♦Bake your own bread. If you’ve tried the gluten free breads available in the freezer section of your grocery store, you already know that gluten free folks are expected to settle for toast. Make 2019 the year you don’t settle! 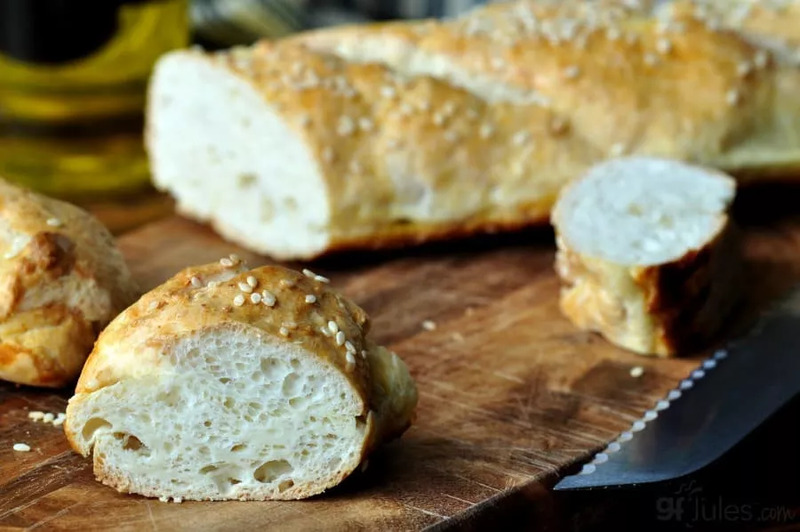 Everyone’s entitled to soft, fresh bread, and with the right ingredients, it’s easy to make a soft, fresh, gluten-free loaf! Read my article on baking gluten free bread in a breadmaker if you have a breadmaker or think you might be interested in getting one, peruse my 18 Tips for Gluten Free Bread Baking, and grab one of my easy, no-fail gfJules™ gluten free bread mixes or pizza crust mixes to make baguettes. You’ll be on your way to delicious, homemade gluten free bread in no time, and you’ll never look back! ♦Eat a better breakfast! We’ve all been told it’s the most important meal of the day (and it is), so make it count with a hearty bowl of gluten-free oatmeal or grits, scrambled egg whites, yogurt and gluten-free granola, healthy granola pancakes, overnight oats waffles … you get the idea! And for those days when you don’t have time for a sit-down breakfast, make a protein shake to go. It will fill you up, give you energy, and deter you from “cheating” at a drive through. ♦Give up dairy. See how you feel. Up to sixty percent of adults are lactose intolerant and most don’t realize that dairy is what is making them feel yucky. There are amazing dairy-free products available now: coconut, cashew, soy or almond ingredients make wonderful yogurts, ice creams, milks, shredded cheeses, cream cheeses, sour creams, butter … the choices are nearly endless! Even in cocktails, I use healthier plant-based alternatives like OWYN protein drinks in place of cream. Every little bit of healthy helps, right?! Even chocolate pudding can be delicious and nutritious, dairy-free! ♦Add nutritional yeast to your diet. Loads of B vitamins, fiber, protein and minerals, with just a tablespoon here and there on your popcorn, quiche, nachos – really anywhere you’d like to add a subtle cheesy taste with tons of added vitamins! ♦Resolve to never leave home without a healthy snack or protein bar, so when your energy levels dip or your stomach starts to growl, you aren’t tempted to “cheat” by eating gluten or unhealthy junk food. Gluten-free protein bars and gluten-free granola bars are a great thing to have with you at all times because they’re portable and won’t go bad if you don’t eat them right away. Some of my personal favorites are KIND Snacks® and LUNA bars, but there are tons of other options for every palate. Here are some more on-the-go ideas to keep you healthy and stave off the munchies! ♦Try a new gluten-free recipe at least once per week – you never know what new foods you might absolutely love, and you’ll never know how much pleasure you can derive by making it yourself … until you try! New recipes don’t always have to be for dessert — veggie sides liven up any meal. Try Tamari Butternut Squash, Sweet Potato Casserole, Apple Butter Butternut Squash Casserole, Maple Pumpkin Cobbler, Southern Fried Okra, Baked Zucchini Fries … anything can be made gluten free! Check out this video showing some of the yummy foods you can make gluten-free, even if you don’t consider yourself an experienced baker. ♦Make soup! Everything from Vegan Potato Soup to Curried Carrot, Butternut Squash to Lentil … they’re easy, quick, hearty and healthy! Oh, and gluten free. And they all go great with gluten free cornbread! ♦Dinner doesn’t have to be hard or boring. And everyone should eat the same meal, regardless of whether they’re avoiding gluten, because it should be that good. Try Pierogi, Pot Pie, Pizza Rolls … and lots of other things that don’t start with P! ♦Don’t deprive yourself of treats. Everybody deserves a cookie now and then, and if dessert is your thing, then by all means indulge! Moderation is the key to any healthy way of life, but hard-core deprivation is the fastest way to failure. Any recipe can be made gluten free, and by making it homemade, you’ll be avoiding all the nasty preservatives, questionable ingredients and potential contaminants, too. If you’re worried about your baking abilities, don’t be! Mixes like my gfJules™ original cookie mix, sugar cookie mix, and graham cracker/gingersnap mix have you covered! Bring back yummy memories like oatmeal cream pies! ♦Looking for recipe inspiration? Use the search bar on my blog and you’ll have access to over 440 delicious gluten free recipes for everything from gluten free doughnuts to soft pretzels, oatmeal cookies to rum cake, and of course lots of healthy dinner recipes for everything from veggie chili to fish tacos, too! My blog was voted #1 Gluten Free Blog 4 years in a row because it’s a wealth of information like this, so take advantage of the resources, articles, news, reviews and recipes at your fingertips! ♦Volunteer to make gluten-free communion wafers for your church. ♦Donate gluten-free foods to a shelter or soup kitchen near you – help a fellow gluten-free person have a good meal. ♦Share the love: invite a friend to your house for dinner and show them how delicious gluten-free can be! What are some ways you resolve to live a better gluten free lifestyle this year? Are you setting an intention? To hear more, listen to the podcast of my radio show on Gluten-Free New Year’s Resolutions! *Some links may be affiliate links or links to product sponsors. As always, all opinions are my own. See my disclosure policy for more information. Working with select brands I love allows me to keep bringing you free recipes, and I hope that in the process, you’ll learn about some of the safe gluten free products I choose for my family. Thanks so much for your support! So much is our perspective, right? Rather than thinking we are going without something, it’s more about how abundant we can feel and eat on our path. I’m not gluten-free, but often eat gluten-free eating largely whole-foods on a vegan diet. I don’t feel with’out’ at all! The yoga analogy rings true – happy 2019! Thanks for sharing your perspective, Dreena. I agree entirely (obviously)! Wishing you a happy and fulfilling 2019! My resolution is to eat less meat and more gf substitutes like quinoa. My resolution is to eat less meat and add gf substitutes like quinoa. Great list! I’m definitely going to work on my gluten-free bread making skills this year! I want to learn how to bake some of my favorite recipes …gluten free …so that they still taste good! My gluten free New Year’s resolution is to bake and cook more of my own food from scratch.